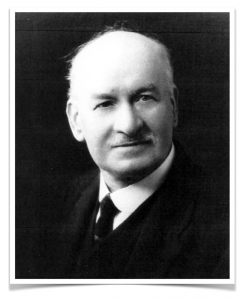 George Allan was born on 21st March 1864, to John James Allan (a tailor and draper) and his wife Hannah at their home in Chapel Street, New Shildon, County Durham. George was found to have an aptitude for music as a boy, learning to sing using the Tonic Sol-Fa method popular throughout his lifetime. Though he would probably have learned this at the British School on Station Street, New Shildon, he was also a choirboy at All Saints Church, New Shildon. It is understood that it was his choirmaster that suggested he find out what he could learn by joining a brass band, a challenge he embraced. George would have joined the New Shildon Juvenile Band, first, under the tutelage of Edward Dinsdale (the Uncle of Thomas E Bulch), and then graduated to the New Shildon Saxhorn Band as a tenor horn player under bandmaster Francis Dinsdale (T E Bulch’s grandfather). Despite being fifteen months younger than Thomas Bulch, George would certainly have played alongside him in both the Juvenile and Saxhorn bands, and early in their working lives both were apprentice blacksmiths at the N.E.R railway wagon works in the town. The Allans moved around New Shildon, from Chapel Street to Adelaide Street, Redworth Road and then back to Adelaide Street not far from the Bulch family. George cited his early musical influences as John Stainer, Friedrich Marx and Muzio Clementi, and reputedly began composing during his teens, though the exact dates of his compositions are not clear at this time. It is claimed that one of the inspirations for his compositions was to attend the Durham Miners Gala, which first involved the participation of brass bands in 1871, and saw the bands leading the columns of marching miners from the respective pits and collieries each year from 1872 onward. Newspaper reports suggest that George continued to enjoy singing publicly as a young man, and he was involved in ‘Free and Easy’ concerts held in nearby Bishop Auckland where on at least one occasion he picked up a prize for his efforts. On the decline and eventual death of Francis Dinsdale in 1884, George, by that point a solo cornet player, inherited the role of bandmaster for the New Shildon Saxhorn Band (his main rival for that post, Thomas Bulch, having elected instead to lead the breakaway New Shildon Temperance Band) and became greatly respected for his work as bandmaster and tutor with the band. Although there are many that do not fit a pattern, George’s compositions, from the titles of his known works, seem to have followed a number of themes at times. There is a small number of pieces inspired by various strengths of wind; “The Gale”, “The Cyclone”, “Morning Breezes”, “The Storm Fiend”: many inspired by places; “Darlington”, “Raby”, “Binchester”, “Silverdale”: and a few, inevitably for the time, with military themes; “The Home Guard”, “The General”. On 16th August 1887, George married Elizabeth Willoughby from Crook, at St Anne’s Church in the market place, Bishop Auckland. The couple initially seem to have lived in the Auckland Park or Coundon Grange area with, or close to, Elizabeth’s parents, but before 1890 the couple had moved into their own home at 2 Pears Terrace, New Shildon. George seems to have begun publishing his own music, from his home. Early copies of his compositions appear quite rough in appearance, though gradually they become highly professional as he began to have his manuscripts engraved and printed in Liepzig, Germany, by Oscar Brandstetter, one of the world’s leading companies at the time when it came to printed music. Much of his music, however, was published in the brass and military band periodicals of the time such as T. A. Haigh’s ‘Amateur Brass Band and Military Journal’ and later F. Richardson’s ‘The Cornet’ for whom he was a musical editor in his spare time. F. Richardson’s were eventually bought out by Wright and Round who still sell a small part of George Allan’s back catalogue as part of their archive collection to this day. This, and the unquestionable quality of George Allan’s compositions, enabled his music to be sold not only throughout Great Britain, but also around the world. There are many cases reported throughout George Allan’s lifetime of his pieces being played as part of a programme of brass music as far away as Australia. On some occasions that music was played on the same programme as compositions by T. E. Bulch, presumably with those in attendance being in blissful ignorance of the fact that those two composers has been born and raised only a couple of streets apart. George may have supplemented his income from his job at the wagon works by offering his blacksmithing skills privately as he is listed as a blacksmith in the 1894 edition of the “History, Topography, and Directory of the County Palatine of Durham” by Francis Whelan & Co, which clearly does not list every employee of the ‘works’. Under George as bandmaster the New Shildon Saxhorn Band had contest success, though at times, as he explained in a short article in ‘The Cornet’ in 1896, he struggled to keep the number of bandsmen up as established players moved away from the area to change jobs when work in the town was slack. For a period the Saxhorn Band were considered second best to the town’s Temperance Band. That 1896 article suggested that George would be well suited to being an adjudicator at brass contests, and that was exactly what he then became. There are a good number of newpaper reports across the North East region citing cases of his services as an adjudicator being called upon either side of the turn of the twentieth century. George and Elizabeth had three children during the late 1800s, Lillie, William Willoughby and Beatrice, and somewhere between the 1901 census and 1909 George had changed jobs at the Shildon wagon works from being a blacksmith to being a wagon painter. This new occupation would appear to have required a reduction in pay, but that may have been enabled by monies coming in from his musical work. At the beginning of the 1900s the New Shildon Saxhorn Band ceased to be, at least under that name. There’s little evidence to suggest that George continued actively as bandmaster of a brass band in the town, but we do know that he spent a time as conductor of the Old Shildon Male Voice Choir around 1909, and later the New Shildon All Saints Amateur Operatic Society. George’s wife, Elizabeth, tragically passed away in August 1911, at their home in Pears Terrace after falling into a coma induced by a brain tumour. She was only 50 years old. George’s father had passed away 2 years earlier in 1909, but his mother still lived at the family home of 65 Adelaide Street, not far from George’s house. In 1913 he is understood to have conducted a brass band at the opening of the new Shildon recreation ground (now Hackworth Park) – though we don’t know which band. After the end of the Great War, George shared his home at Pears Terrace for a time with his daughter, Beatrice, and her husband, John Robert Tenwick Appleby of Brusselton, a schoolmaster who had been a medic during the war, so we know that he wasn’t entirely alone after the passing of his wife. However, a few months before his mother passed away in September 1925, George took the decision to retire from the wagon works altogether and moved with one of his daughters and her husband to 4 Osbourne Terrace, Leeholme, County Durham. From there George continued to publish many of his own compositions for sale and continued to be prolific in this work. He continued to have connections to New Shildon and to work with the New Shildon All Saints Amateur Operatic Society. The photograph on this page was taken in 1927 and appeared in a programme for a Feb 1928 performance by that company. 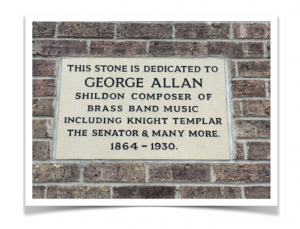 George Allan passed away on 16th March 1930, at Osbourne Terrace just a few days before his 66th birthday. His death certificate cites his death as being caused by chronic nephritis and bronchitis. He was laid to rest on March 27th 1930 at All Saints churchyard in New Shildon with close family and friends in attendance. A handful of, what are considered to be, George Allan’s finest contest marches (marches of a sophistication and complexity designed to highlight the very best capabilities of a brass band) are still played by some brass bands around the world even now, in the twenty-first century. Yet there are many more of his compositions to be heard and enjoyed, and to fully appreciate it we feel it’s important to understand something of the man himself, and that’s something we hope to be able to reveal more of through this project. At the time of writing, within the the town of his birth, the only formal commemorative object in recognition of his life and achievements is a stone block situated in a wall on Shildon’s Church Street opposite the Town Square. Here’s a wonderful rendition of the march ‘The Wizard’ – a truly spectacular piece with (as George himself once put it in an ad in the brass band press in 1911 found by Bob Wray) “this is splendid, grand effects”. You can see why we chose the title of this piece as our characterisation for George Allan.